Abstract. Mercury was measured onboard the IAGOS-CARIBIC passenger aircraft from May 2005 until February 2016 during near monthly sequences of mostly four intercontinental flights from Germany to destinations in North and South America, Africa and South and East Asia. 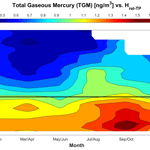 Most of these mercury data were obtained using an internal default signal integration procedure of the Tekran instrument but since April 2014 more precise and accurate data were obtained using post-flight manual integration of the instrument raw signal. In this paper we use the latter data. Increased upper tropospheric total mercury (TM) concentrations due to large scale biomass burning were observed in the upper troposphere (UT) at the equator and southern latitudes during the flights to Latin America and South Africa in boreal autumn (SON) and boreal winter (DJF). TM concentrations in the lowermost stratosphere (LMS) decrease with altitude above the thermal tropopause but the gradient is less steep than reported before. Seasonal variation of the vertical TM distribution in the UT and LMS is similar to that of other trace gases with surface sources and stratospheric sinks. 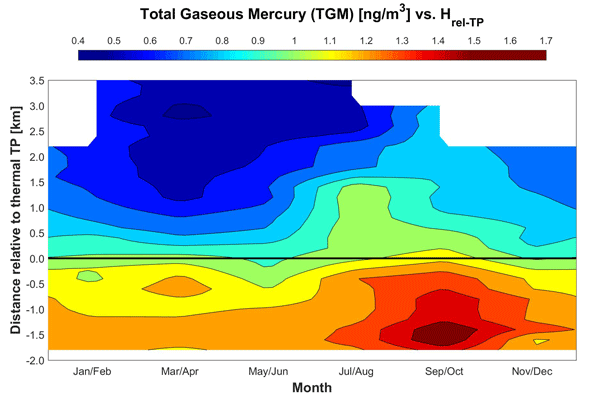 Speciation experiments suggest comparable TM and gaseous elementary mercury (GEM) concentrations at and below the tropopause leaving little space for Hg2+ (TM−GEM) being the dominating component of TM here. In the stratosphere significant GEM concentrations were found to exist up to 4km altitude above the thermal tropopause. Correlations with N2O as a reference tracer suggest stratospheric lifetimes of 72±37 and 74±27 years for TM and GEM, respectively, comparable to the stratospheric lifetime of COS. This coincidence, combined with pieces of evidence from us and other researchers, corroborates the hypothesis that Hg2+ formed by oxidation in the stratosphere attaches to sulfate particles formed mainly by oxidation of COS and is removed with them from the stratosphere by air mass exchange, gravitational sedimentation and cloud scavenging processes. How to cite: Slemr, F., Weigelt, A., Ebinghaus, R., Bieser, J., Brenninkmeijer, C. A. M., Rauthe-Schöch, A., Hermann, M., Martinsson, B. G., van Velthoven, P., Bönisch, H., Neumaier, M., Zahn, A., and Ziereis, H.: Mercury distribution in the upper troposphere and lowermost stratosphere according to measurements by the IAGOS-CARIBIC observatory: 2014–2016, Atmos. Chem. Phys., 18, 12329-12343, https://doi.org/10.5194/acp-18-12329-2018, 2018. Total and elemental mercury were measured in the upper troposphere and lower stratosphere onboard a passenger aircraft. Their concentrations in the upper troposphere were comparable implying low concentrations of oxidized mercury in this region. Large scale seasonally dependent influence of emissions from biomass burning was also observed. Their distributions in the lower stratosphere implies a long stratospheric lifetime, which precludes significant mercury oxidation by ozone.